Sure, exhibition trade shows are a good avenue for you to market your brand and sell your products and services. But with hundreds and sometimes thousands of competitors exhibiting in the same show, how do you make sure that your stand will attract visitors? How do you stand out from the crowd and become a hit? Here are some ways you can attract visitors to your exhibition stand. 1. Big doesn’t always mean attractive, even small stands can be beautiful, too. Unless you want to be remembered as the biggest stand to exhibition in Gulfood Manufacturing, you could also try booking a smaller stand and invest on achieving the right look and feel. 2. Be creative with lighting, presentations, furniture, sounds, and screens. When you visit a trade show, you’d hard have a hard time remembering which is which. Most of them look generic and won’t make an impact to the visitor’s mind. One way to stand out is to be creative in lighting, presentations, furniture, sounds and screens. Make your presentation a little bit more than the usual. 3. Prepare giveaways. Who doesn’t love freebies, right? This is one way you can attract your visitors to drop by your stand. But make sure to choose relevant and memorable merchandise to represent your business. You can give them free items in exchange for their contact details so they can be a part of your database. 4. Pick the right people to manage the stand. Make sure to delegate each task to the relevant team members. Front liners should be accommodating and exude a friendly aura so as not to intimidate visitors. 5. Create momentum pre-event, during the event and post-event. Tell your clients and business partners about your plan to exhibit. Combine conventional and new digital marketing to cover your event. And after the show, don’t forget to thank your visitors and tell them that you look forward to doing business with them soon. We can help you with your exhibition needs as we have participated in Gulfood Manufacturing several times. 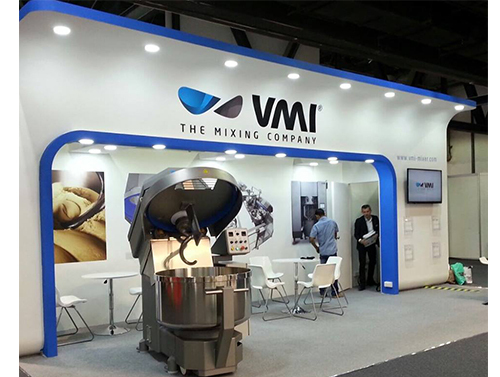 Here is one of our clients from the previous year’s edition of Gulfood Manufacturing.